This book is directed towards people who wish to study and understand management. The first chapter introduces the general approach of the book, and places management in a broader historical context than is usually adopted in most management texts. Management may be practiced without the benefit of any theory, but more reliable results are likely to be achieved with one. There are still many senior managers who believe that management can be learned only by experience. Corporations allow managers to be created instantly, simply by including the word ‘Manager’ in the job title of the employee. This is comparable to describing a person as an athlete the first time that they run to catch a bus. Similarly, if people sing operatic arias in their baths, this does not qualify them to be described as Opera Singers. In contrast, the academic awards of Diplomas in Management Studies and Masters of Business Administration proliferated in Britain during the last years of the Twentieth Century, and were frequently awarded to people with little or no previous management experience. With this range of backgrounds of experience and academic study it might be expected that by the beginning of the Twenty-first century management would embody fundamental principles that were clearly understood by all. However, during the ‘dot.com’ bubble most well known principles of investment and management were turned on their head or ignored by industry, commerce, experts and advisors. Neither previous experience nor existing theory, however clearly stated or loudly repeated, appeared to have lead to sound management decision-making. Managers over four thousand years ago could have known that triangle A is right-angled. Using that knowledge they might also have known that rectangle C had four square corners. However, knowing the lengths of the three sides of triangle B would have left them without any clue as to whether it was right-angled or not. Similarly, knowledge of the lengths of the four sides of quadrilateral D would give them no information as to whether the corners were square or not. 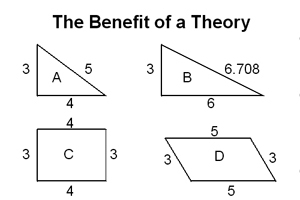 An elementary knowledge of the theory of Pythagoras' Theorem and Euclidian geometry, developed two thousand years later, would have made all these issues clear and unarguable.